Three liveaboard boaters attended the CRT Annual Meeting in Birmingham on 27 September to register their objection to the joint CRT and IWA attack on the rights of boaters without home moorings. 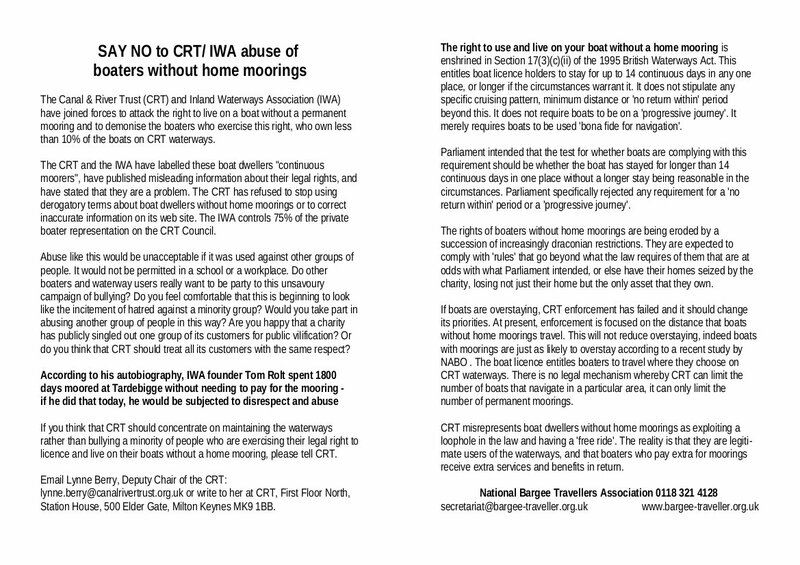 Helped by a large poster, they handed out leaflets and discussed the situation with other boaters and with several CRT Trustees and senior staff. You can download a copy of the leaflet or read it below. This entry was posted on Saturday, October 20th, 2012 at 7:38 pm	and is filed under Continuous Cruisers, CRT Policy News, Letters to BW and others, News. You can follow any responses to this entry through the RSS 2.0 feed. You can skip to the end and leave a response. Pinging is currently not allowed.